There may not be a scientific basis for this assumption but there seems to be a consensus that when asked to choose a “superpower” most people would plump for the ability to fly. Of course, a brief trawl of the internet reveals that a significant number would like to be invisible but I suspect many of these are boys who can’t yet reach the top shelf in newsagents. No, flying is the classic choice. Now I get it. Even on a grey, wet, cold day with poor visibility, if you are sitting in front of a former Red Arrow pilot as he executes a stall turn in formation you will be breathless – in a good way. And the good news is that anyone can do it. directing your gaze it would be impossible to take it all in. In April 2006, 2EXCEL was launched and the business is growing at speed. The display team pilots took 30 days (not the usual year) to retrain for aerobatics in a propeller rather than jet plane and now 12 pilots and two non-flyers are employed. The lack of dedicated ground staff seems to have engendered a new appreciation for RAF engineers. Passenger trips usually take place before a display as the sight of what The Blades team is capable of can be a little daunting when you still have your own flight in prospect. The pilots all have distinguished war records and have flown with the Red Arrows – thousands of hours between them – but, “Being a brilliant pilot is not enough, the personal element is hugely important,” Chris explained. Indeed, a trip with The Blades is apparently good for curing flyers’ fears. Andy loves “to land and see smiling faces”. The flying com-munity appears to be friendly and he is certainly immersed in it. He commutes to The Blades’ base in Northamptonshire from his Lincolnshire home by plane in half an hour, so his wonderfully gentle and sunny demeanour can be at least partly explained by never having to sit in traffic. Unsurprisingly, all involved seem very happy in their work. Blade 1, Myles Garland, formerly a weapons instructor, a squadron leader by the age of 29 and leader of the Red Arrows “Synchro Pair”, describes it as being “as much fun, if not more so, than anything I’ve done. Seat of the pants stuff.” Andy thinks the show is “as impressive as the Reds”, and Mark Cutmore that it’s “the best I’ve ever done, the most challenging and rewarding”. Each seems to relish the chance to share his flying and it is an exquisite experience. 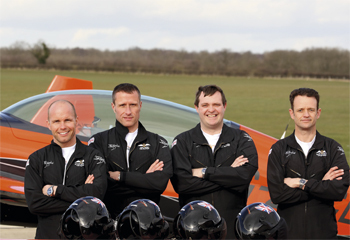 All of them had flown with at least one of the other pilots before joining The Blades so they can rely on their team. “Four people who went to war with me in Kosovo are here with me now. I’ve already trusted them with my life so putting on events together is not a worry,” Chris told me. Having been issued with a pilot and a flying suit, and paid close attention to the safety briefing (parachute rip cord here…), I did take a moment and hope I wouldn’t be sick (paper bag tucked in webbing of parachute harness). There is no cause for nerves, of course. My pilot, Mark Cutmore, has displayed the RAF’s Jaguar and been Red Arrows’ deputy team leader. What we were going to do would probably be less taxing than the school run for him. bumping into each other. No such problems in the air, for which I’m thankful. The planes sweep into their trademark “Blades Box” formation with the certainty of being pulled together on strings. To look around then is astonishing. We are cruising 12ft apart, impossibly close to the next plane. It seems almost touchable but during displays (no passengers) the formation distance is a mere 6ft, which really is hard to comprehend. A little light rolling to ensure the passengers are not getting scared or nauseous and then on to the manoeuvres. These, exciting enough on their own, take on another dimension when executed in formation. The stall turn is a case in point. Blade 4, “Cuttie”, and I were on the far right and breezily he told me to look left as we climbed. The other three planes were hanging vertically, apparently motionless, in the big blue sky like a row of spy-hopping whales. And then it dawned that we must be in exactly the same position. I hardly noticed the G-force until Cuttie asked whether I was happy and I tried to give a thumbs up: while I’d been enjoying the view someone clearly tied very full cartridge bags round my wrists, which were reluctant to move. The Blades are happy experiencing forces three times more than the trifling 3-Gs that had me staring in disbelief at my inert arm but they still take it seriously, even once you’re back on the ground. legs are a little uncooperative,” I was warned. It took some effort to look nonchalant during the dismount, and I realised how tricky it would have been to “stand on the seat and then jump over the side” if things had gone wrong in the air. But by then the aerobatics happy pill was coursing through my veins, so it was no matter.